In the last US presidential debate, incumbent Barack Obama sort of promised to save us. His exact words were: “If Israel is attacked, America will stand with Israel.” This assurance in itself – be it sincere or otherwise – should send shivers down Israeli spines. There is, of course the question of what “stand with Israel” actually means. The phrase is too vague for comfort. But the cynical spin-potential isn’t our greatest cause for worry. Our primary concern should be engendered by another phrase, “if Israel is attacked.” Maybe we’re ungrateful, but heck, we wouldn’t like to find ourselves in that deep existential hole where we’re bleeding, can’t help ourselves and must depend on the dubious goodwill of foreign benefactors like Obama to come – be it gallantly or reluctantly – to our rescue. The better plan is to preempt the danger to our continued existence and thereby obviate the need to save us. That’s the inherent rationale in confronting Iran’s ayatollahs with red lines as they ramp up their atomic ambitions. But Obama is leery of red lines since these might be construed – Allah forefend – as an ultimatum, and the nature of ultimatums is that they might lead to a showdown. That isn’t the impression the current American administration wishes to impart – not even in a moot manner. Washington’s philosophy is live (prolong Western non-intervention) and let live (let Iran behave pretty much as it had been), even if the upshot is that Israel might have a harder time staying alive when all this reaches its inevitable culmination. There is something enticing in Obama’s assertion – even if not explicitly so articulated – that if America lets Iran be, Iran would reciprocate in kind and ignore America with equally gracious consideration. If America only talks the talk about the Iranian nuclear threat, no Iranian excesses would come back to haunt America. Whatever other inconveniences accrue from Iranian escalations, there’d be no skin off sensitive Washington noses. Those in harm’s way – in a word, Israelis – are therefore required not to endanger the splendid stalemate. The derivative stability of deadlock awards perks to too many players to be dismissed selfishly by Israel. It serves Iran, which can use all the extra time it gets to develop its bomb. It can serve Obama, who needs to get to Election Day un-bothered. It can serve Europe whose penchant for perfidy wasn’t consumed by the roaring fires of the 20th century. Not least, it can serve the Russian/Chinese quest for lucre. Mind you, Obama swears up and down that he’s not inimical to us and has Israel’s best interests at heart. However, in his infinite wisdom he knows better than us what’s best for us, and that invariably meshes with what he sees as best for himself. See? Apparent understanding for the bully’s point of view. That point of view was vehemently elaborated upon in Nuremberg a little over two weeks earlier on September 12. There Hitler hoarsely hectored that Czechoslovakia was a fraudulent state, whose existence violated international law, much as the Arab/Muslim invective delegitimizes Israel in our time. As Israel’s democratically elected prime minister, Binyamin Netanyahu, is now demonized by laid-back liberals and intellectual sloths, so there was self-serving resonance in 1938 to Hitler’s charges that Czechoslovakia’s President Edvard Benes sought to exterminate the Sudeten Germans. Presaging the Arab refugee mythology, Hitler boldly asserted that ogre Czechoslovakia expelled over 600,000 Germans from their homes. He further accused Benes of assorted blood-curling war crimes and of denying the Sudentens their due self-determination. The icing on Hitler’s Bavarian pastry was to paint little friendless Czechoslovakia as the aggressor whose belligerence threatened Germany. The world’s appetite for calumny has clearly not abated since those dark days. We need only pay heed to Obama’s not-so- subtle justification of the Palestinian “narrative.” That was eminently evident in his June 2009 flattery fest to Islam at Cairo University, where he attributed Israel’s creation to the Holocaust (as per the Arabs propaganda that a guilty Europe dumped unwanted Jews in their midst) and he bewailed “the Palestinian pain of displacement” (in mind-boggling omission of the fact that this displacement was self-inflicted, resulting from a genocidal attack three years post-Holocaust on newborn Israel). The Czechs, Chamberlain stressed in his day, weren’t popular with his constituents: “That is how they are feeling. That is my answer to those who say that we should have told Germany weeks ago that, if her army crossed the border of Czechoslovakia, we should be at war with her. We had no treaty obligations and no legal obligations to Czechoslovakia and if we had said that, we feel that we would have received no support from the people of this country. We Israelis should recognize the above as the all-too-familiar arm-twisting pressure for concessions, goodwill gestures, confidence-building measures and placing no obstacles in the path of peace. 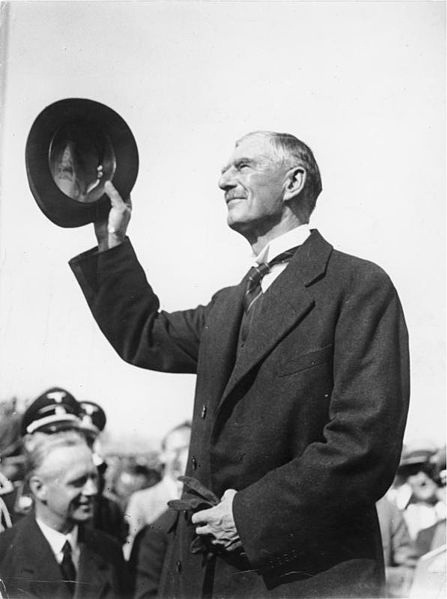 Obama habitually resorts to all these ploys and now urges Israel as strongly as Chamberlain did Czechoslovakia, albeit more cloyingly (due to vote-getting constraints), to learn to tolerate the Iranian nuke menace. Honeyed blandishments aplenty already effuse from Obamaesque lips in one adaptation or another. It’s only our stiff-necked intransigence which prevents us from seeing his light and bowing down in gratitude. Czechoslovakia was destroyed a few months after Chamberlain had “saved” the beleaguered republic and seduced it with the sweet smells of Swiss success. Within the year World War II broke out. Europe was plunged into an Armageddon of unparalleled horror. We cannot afford to be likewise saved, i.e. to disregard appeasement’s bitter fruits as we hear Obama’s cabinet members and official spokespersons dissociate the administration unmistakably from any self-defense Israel might mount. The subtext is to signal Iran that Israel would be alone if it disobeys Obama. The Iranians might read this as a green light to unleash hell on Israel. The Obama administration maintains that there’s still ample time for palaver and sanctions. But why then aren’t the sanctions more stringently enforced, and when will time run out for engaging the undeniably deceitful Iranians in futile prattle? The reluctance to designate deadlines makes a mockery of the entire process. If all options are indeed on the table, as per Obama, why is none of them even hinted at? The failure to do so suggests more than anything that Obama is about as intent on stopping Ahmadinejad as Chamberlain was on fighting Hitler. But there’s an underlying difference nevertheless. There’s no way Obama doesn’t know the treacherous nature of his Iranian interlocutors. He isn’t beguiled. Having wasted years of invaluable time, odds are that Obama doesn’t really intend to prevent Iran from obtaining nuclear weapons. Obama certainly doesn’t want Israel to preempt that probability. He prefers Israel threatened, frightened and in dire need of being saved. That would turn Israel into an ineffectual vassal and earn him eternal Muslim gratitude. “Europe was plunged into an Armageddon of unparalleled horror.” – Hundreds of thousands who’d voted Chamberlain and Daladier in paid with their lives for their electoral mistake. Food for thought, as relevant today as it was then. Elections are not a game: in a precarious time people’s very existence depends on them. Why does the Israeli government always feel the need to kowtow to the American government, run by an ant-semitic state department. Doesn’t the Israeli government have any vision atall as to the reality of the hatred the world has for them and all the Jewish people. One who comes to destroy you- destroy him first. When will the Israeli government ever learn? Obama is in no way to be believed, he is an evil man. The Jews who vote for him are not any better. The lives of 6 million Jews across the sea, are suspended on a horsehair, twisting in the wind, and all they care about are government giveaways. Revolting to the core. There will be higher comeupance. The hardest thing to swallow in this unfolding,soon coming epic calamity, part 2 is that so soon after Germany part 1 the people of Israel who know the recent past fall right in line for the final act. I understand that naive,gullible Israel was snared by false promises and the sinister smiles of false friends this time instead of the gas chambers,but there should have been a great awakening in Israel to the trap being laid under the ruse of this hoax peace process by now. Ariel Sharon warned about ISRAEL not replaying the part of Czechoslovakia before he met with President Bush and capitulated to his pressure to ethnically cleanse Gaza for his remarkable and well received vision/nightmare of a Palestinian state. The only thing Israel had going for itself was a strong military which the naive,gullible,sucker,prostitutes in Jerusalem allowed their pimps in Washington to restrain as they came to the rescue of Hezbollah in 2006 and Hams in 2009. The stupidity of Israel allowing itself to be restrained so soon after the holocaust and with such crazed neighbors who are all close cousins to the Nazi’s is unforgivable and yet none of these fools are convicted of treason and in prison. The criminal leaders have even used the IDF to target the most honorable Jewish builders of Zion. The sheep of Israel heading for slaughter,part 2 are even content to have the biggest,criminally negligent fool as their President. A people who ignore their God are suckers for self destruction and even assist their smiling enemies in bringing it about. On US TV there is an abomination known as Chris Mathews (NBC/MSNBC). Two weeks ago on his Sunday morning program Mathews gave the final word to a worse abomination, Andrew Sullivan, who ended the show by saying Netanyahu is the greatest threat to world peace today. I can’t believe he got away unchallenged anywhere in the media, I feel totally alone in the universe as Israel’s advocate. NOBODY in his right mind should vote for him ! Hitler was voted into office and Obama must NOW be voted OUT of office ! As lovely a sentiment as that is, the greatest evidence that Obama will more than likely be re-elected is, as I was travelling to a wedding yesterday from Jerusalem to Givat Yeshayahu in central Israel, the cab driver told me matter-of-factly and without hesitation or doubt, that even though he didn’t like it, Obama would be re-elected, especially with the exposure he got to appear presidential in the aftermath of Sandy. You know the old proverb, that if you want to get the real scoop, just ask a cab driver. Don’t spill the beans Uncle Noodles…three days and counting…YES WE CAN!!!!!!! WE CAN STILL BOOT HIM!!!!!!!!!!!!!!!!!!!!!!!!!!!!!!!!!!!!!!!!!!!!!!!!!!!!!!!!!!!!!!!!!!!!!!!!!!!!!!!!!!!!!!! A bear hug for you Sarah ! Your comparison of Chamberlain and Obama was right on target and in time…! But Chamberlain was a naive coward and the coward Obama has also his private antisemitic agenda…Obama cannot be given the excuse of naivety ! He has choosen his friends and his friends are the Muslims ! HE HIMSELF, HUSSEIN OBAMA IS AN ADHERENT OF THE PROPHET ! Very well said. Thanks for this little slice of history that we need so much. I think Chamberlain was the more trustworthy between he and Obama. I don’t think Obama is capable of naivety. A terrific writer, Sarah Honig weaves a seemingly convincing comparison of Obama to Chamberlin as being an appeaser to Iran’s threat. One big difference, however. The Brits were ambivalent towards the then newly formed nation, Czechoslovakia, but the American public is solidly behind Israel qua Israel and as a critical ally to America and our (Western) interests in the Middle East, namely OIL. And when push comes to shove, Israel is our largest aircraft carrier in the Middle East. God forbid. A little known fact is that the leaders of the German army were quite worried about Czechoslovakia, that they might not be able to defeat the Czechs, who had a better military situation than people now days realize. The German army was still in “Bluff Mode” at that time, not ready to fight a major war.